Quality assurance for manufacturers of food and nutrition products - Seagreens® Certified Ingredients have a range of functional and nutritional applications of interest to consumers. Sustainable mechanised production at a realistic price with nutritional quality, consistency and international regulatory compliance, remains Seagreens' innovation and the start of a fledgling industry. Then came Seagreens nutrition research programme in 2007, strengthening the scientific basis for its use as a conventional whole food ingredient. Replacing salt in manufactured foods was a first, but please ask for our more detailed presentation of subsequent research to understand the potential for your own products. A series of studies has explored the possible health benefits, ranging from cardiovascular diseases and weight management, to diabetes, digestion and special diet foods. 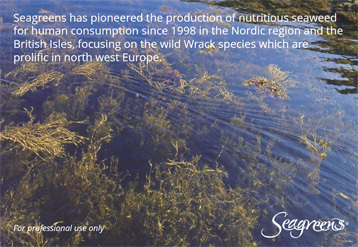 As a result Seagreens' founder set up the Seaweed Health Foundation for 'standards, research and information' in 2010. Henner Thies, a post graduate in Munich, has studied some of the trends in the developing seaweed industry. He interviews some of the people involved including small, artisan producers on the beaches of Cornwall and Seagreens larger scale harvesting in Scotland, set against a backdrop of academic intrest in potential futures like biofuel and artificial production. The Foundation holds public events, co-ordinates research, and publishes data of value to industry, media and the public. Since 2014 it has worked with the Biodynamic Association, seaweed producers and industry customers to introduce the world's first quality assurance scheme and standard for the production of Nutritious Food Seaweed. It helps seaweed producers and brands access broader and more valuable markets, and assures consumers of product quality. Please click here to lend your support.